I was first introduced to this famous little western eatery by my colleagues from my first job, almost 5 years ago when we were attending a founction in SinChew office. I vaguely remember that was easily one of my most enjoyable lunch experiences as the food were pretty good & hearty, plus my bosses paid :D And when I found out that they were relocating to Aman Suria after one of my my daily gymming sessions, I knew I just have to try out the place with mah gym buddies! So yesterday after gym me & Mike decided to go over there because he is on a Paleo diet and western foods provide lotsa dishes for this diet (which failed his diet later after some persuasion from me to try their famous nasi lemak). We reached around 9.30pm and found that the place was still quite packed with people, a proof that 6 2 10 still has a loyal following of crowds. Always a good thing to see. 6 2 10 has always been known for their pork nasi lemaks and western dishes. Mike decided to order the grilled chicken with brown sauce (RM14.50) because he reckons its a good paleo meal (refer above). Thats when the salesperson in me came in and insisted that he try the nasi lemak with pork as well, and the IT guy gave in hehehe. The chicken came first and certainly looked good. Chicken thighs were preferred instead of breast because naturally the cut has more flavours in it and for you who reckons chicken breast are healthier, the difference in calories is only less than 100. Why substitute great taste for such a tiny amount of calories? The piece was juicy & tender, just how a good piece of grilled chicken should taste like. fries were good too as I suspect they use natural cut fries instead of industrial ones. The brown sauce however could be a tad thicker and saltier. I ordered the beef stew (RM16.70) and it arrived less than 10 minutes later. The stew has a very thick & beefy taste and has the scent of rosemary and thyme, just the perfect herbs to have with beef. I could taste that they use shoulder meat and has bits of beef tendons in it, remarkable combination. The meat was cooked for a long time I am sure as the pieces were soft and tender, and has a very please "off the bone" texture. Complimentary garlic bread were given and they did a great job sucking up all the leftover stew, good stuff! The final dish was the best of the lot, Nasi Lemak with pork sambal (RM8.50). We wanted to order the pork rendang instead but it was sold out....come earlier next time!!! Nonetheless, the pork sambal taste great too, minced pork fried with sambal which is similar to Nam Phrik or Thai minced pork, something I really like. goes well with their fragrant nasi lemak, and spicy sambal. a winner this one. Special request from Mike: "eh let me have a cameo appearance on your blog lah!" So here is Mike sapu-ing 2 dishes at the same time...at night...after gym...and he still has his 6pacs! I hate him. Food here is as good as I remembered 5 years ago at their old shoplot in Section 17, although the price has gone up a little bit, which is fine by me. The environment is certainly much better and its a really quite a comfortable place to makan. I would recommend their grilled fish & mixed grill as well, and of course their rendang prok & curry chicken to go with the nasi lemak. Beer is served too and BYO wines are welcomed. Here's a map for you readers. 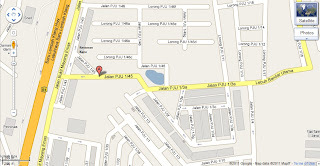 If you are coming from LDP, turn left once you see St. Ignatious Church @ Kelana Jaya on your left. 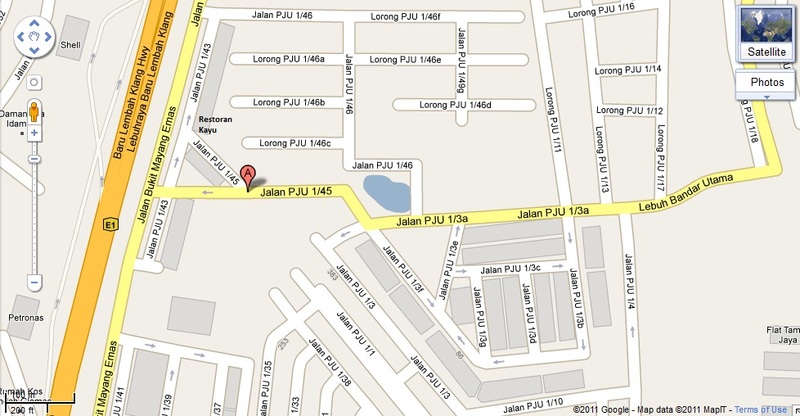 go straight all the way until you see Kayu restaurant on your right. Turn in with Kayu on your left and you'll see 6 2 10 on your left, a corner lot. parking is fine here at night but can be painful during working hours. The food was nothing special and very much a disappointment ... in term of $$$. No quality and it more like fast food instead. i beg to differ, i think its good. everyone has their own opinions i guess. I think you cant ask for anything more than this. We used to visit the S17 outlet when the old folks were in charge. Used to be really good value for money and delicious food...that was before the son took over. Nowadays, it's just plain biz with no personal touch...they even precook the meats at lunch time and reheat them at dinner...yucks! pls dont ask for food to be " saltier". most malaysians dont know how to appreciate western food lah...it tends to be bland with little salt or seasoning. you are supposed to add your own salt and pepper!! pseudo western at places such as Kim Gary are bad enough - although creative, the taste is a tad too salty. most Asians preparing western are so afraid the food is " bland" ...the big mistake. YES WESTERN FOOD is bland. little or no salt added during cooking. If you ask for more salty, it shows you know nothing about western dining. as mentioned by anon above, you are supposed to add your own salt and pepper at the table. and YES i do agree the food at THE ShIP is getting salty too. unlike years ago. Kim gary - really over seasoned meat - the original flavour of the meat/ fish / poulty is killed! by the way, the so called Hainanese western food eg "chicken chop" etc that you get around town, is not the standard to compare with. it is what it is: "hainanese style" - Asianised western cooking as in much seasoning. If you want salty western food then go to eat hainanese western or kim gary!